Silicon is an element that is often overlooked in plant nutrition. Pro-TeKt® provides supplemental potassium and silicon in an easy to use liquid concentrate. Benefits of silicon include greater tolerance of environmental stresses and mineral toxicity or deficiency. 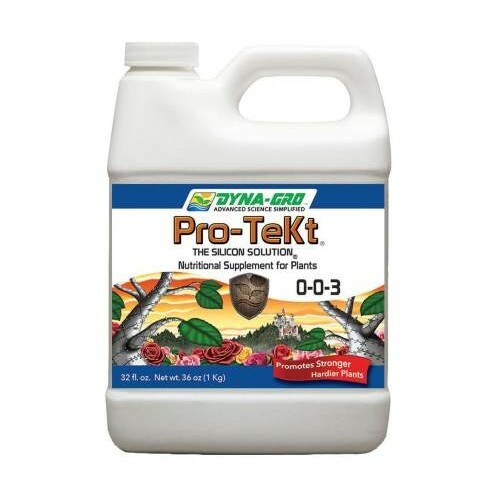 Silicon deposited in cell walls forms a "Pro-TeKtive" barrier, defending your plants from water loss due to high temperatures. The increased strength of cell walls also results in drastic improvement of stem and branch strength. Since silicon is rapidly bound in leaf tissue and deposited in a non-translocatable form within 24 hours of uptake, a continuous source of soluble silicon throughout the plant's life is very important.